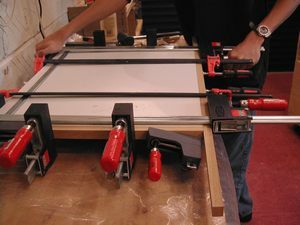 I used the Makita 3612CX 1/2" Router and the Woodpeckers Uni-lift to form my router table. 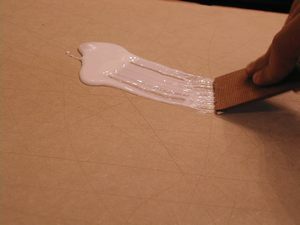 Creating a solid, and smooth table surface. I have chosen to form my top from 2 materials. MDF because of its stable nature, and strength. 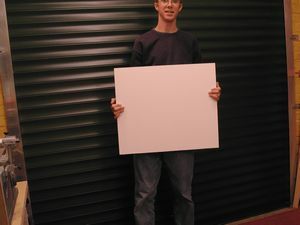 Also white faced hardboard, which has had a plastic laminate applied, this will be resistant to wear and tear, and will allow my wood to glide smoothly. 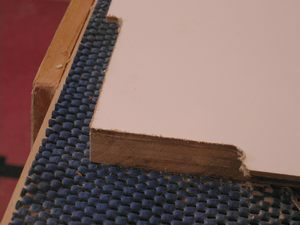 I have scratched my MDF surface to allow my glue to get a good key, the back of the white faced hardboard already has a texture, which is good. Now, ideally here I should be using contact adhesive to glue these 2 together, but I don't have any and didn't see the need on buying any for this project alone. I am using a water-proof PVA wood glue, i'm sure this will do a fine job. I'm using a scrap to apply the glue evenly over the whole spread of MDF - make sure you cover every inch! You can see here again, lovely and even. 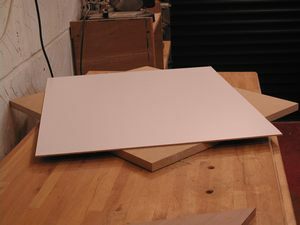 I laid my hardboard face down on a perfectly flat surface (Another board of MDF) and lowered the MDF top onto it. You can see there is an over hang, I will trim this off at a later time once the top has cured. 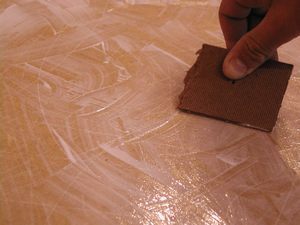 I used a hard roller on the back of the MDF to press the 2 sheets together, and remove and air bubbles etc, although this wasn't too much of a problem. Clamp time, and lots of them. I also used some wooden battens to help the even pressure across the surface. 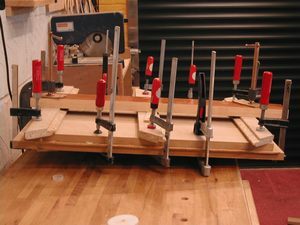 I wanted to let the glue fully cure, so I left it for about 7 days before removing the clamps, that way I could be sure there is no chance of the hardboard rising from my top because of un-cured glue in the centre. Here it is, perfect top for my new router table. Remember the overhang I left? Its time to trim it off. 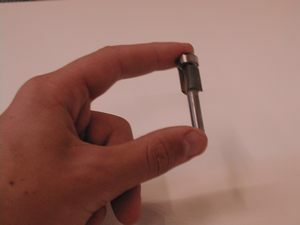 ....The bearing glides along the mdf and the cutter then trims the hardboard flush. Very effective system. 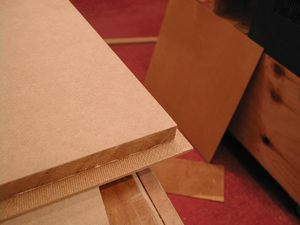 Now, because my router table will be used alot (Well I like to think so) I'm going to need to protect the edges of my hardboard otherwise it will bet caught and scuffed up. I have cut some strips of oak which I had knocking around in the scraps bin, and ripped them down to side. 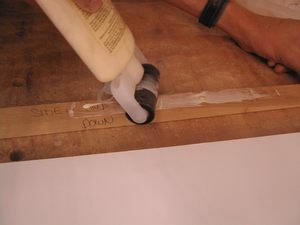 Here I am applying glue with my roller. You don't have to use oak (Although it will last longer than the router itself) you can use another hardwood like beech, ash, maple, mahogany etc. You could even use a softwood like pine, although this may wear a bit more. I am here clamping the edge banding in place. You may notice I have not applied any along the back, which could be done easily, but I did not see the need as this area will remain un touched mainly in use.